There were angry and vocal protests to Mayor Vera Katz. Two appeals were filed seeking a venue change prior to the event. There were appeals to the city Noise Review Board. Police were a little edgy. I’m talking about the Rose City Thunder. It’s coming up on the 10th Anniversary of the most legendary and controversial motorcycle event in the city’s history. Portlandia was one of only four cities in the U.S. chosen for the “Ride Home” tour. And it all happened in the lazy dog days of summer in 2003 in the South Park blocks. In celebration of Harley’s 100th Anniversary, the motor company and local dealer, Destination (now Paradise) H-D in Tigard sponsored the event with the purpose to send riders off in colorful fashion to the “Harley-Davidson 100th Anniversary Ride Home“. 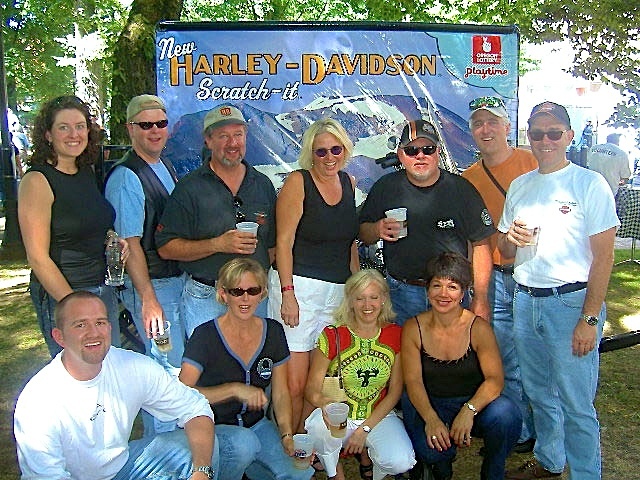 After more than two months of controversy, a unanimous City Council vote along with assists from Harley supporters and the downtown business establishment, the kickoff party for Harley-Davidson’s 100th anniversary was a go on Friday, August 15, 2003. There were loud exhausts, public address systems, and rows of the famous “honey buckets” (portable toilets). Organizers estimated 15,000 visitors, plus 2,000 motorcycles attended pumping an estimated $1.5 million into Portland’s economy. To be sure, there were inconveniences to downtown residents by streets that were closed, as well as the beer gardens, food, merchandise vendors, live music, motorcycles, and the associated crowds and, teeth-chattering rumble of the hogs’. The South Park Blocks area residents were not impressed and could give two shakes of a unicorn’s tail that the involved bikers were well behaved and left a lot of their money in the city. None the less, streets were filled with Milwaukee iron, chaps, bandanas, tattoos and ‘If I have to explain, you wouldn’t understand’ t-shirts. Even the Oregon Lottery got involved with a Harley-Davidson Scratch-It campaign and where a Madras man won a motorcycle. The Portland event was a lead up to the great trek back to Wisconsin and as it turns out the atmosphere in the Park Blocks on that weekend were surprisingly mellow. Participants were low-key, drank their refreshments and moved about the event in an orderly fashion. The so called “incensed residents” returned to their usual way of life when the last Harley departed downtown, but continued to grit their teeth and fight another day on the great Fluoride debate of 2013! Photo taken by the author.